You are currently browsing the category archive for the ‘seeds’ category. Used to be that saving seeds was for Y2K wackos like our hippie neighbors, who this year ordered the $99 Armageddon Package from the Ark Institute. The package provided them with a few dozen of the basic seeds they will need to survive the end of the world, including cayenne hot peppers, pie pumpkins, drought-resistant canteloupe, and three kinds of onions — what the Institute considers the basis of a lifetime food supply. Seeing as Y2K has come and gone, the Institute is naturally offering a new doomsday scenario, one that tags GMOs, or genetically altered seeds, as the latest threat to food security. Whoa. Suddenly the survivalists are so New York Times food section. Witness the mainstream attention that Amy Goldman’s glossy book, The Heirloom Tomato, has received, for example. One message of her book is that GMOs are “tools of industry”. Being a step or two behind the times, GMOs didn’t hit my radar until my friend Caroline gave me some Romano bean seed earlier in the summer. Faithful readers may recall that her seed was passed along by a dying neighbor named Wally, who himself got them from Italian immigrant pals in the early 1900s and grew them all his life. I was totally taken with Wally’s bean story. I planted the seeds right away, and while I waited for them to grow I plowed through Claire Cummings’ Uncertain Peril, an enlightening history of seed saving and the more recent co-optation of seeds by multinational agribusiness giants and their GMO products. My review of the book posted earlier this week on the Blogging Bookworm, thanks to the support of fellow blogger Katrina, and another version appears in our community garden newsletter so I won’t rehash it here. But the end result was I decided to save some seeds of my own. There wasn’t much drama — I just let my arugula bolt. Arugula’s the sort of plant that will pump out massive seed pods if you would only, for example, go away for the weekend. 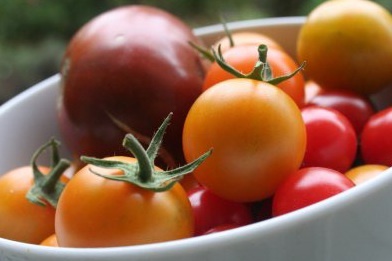 Now I’m thinking of trying for lettuce and tomato seeds, which are reputed to be relatively easy, in addition to being two things you’ll want to slap on your local burger. And I wouldn’t be worth my salt if I wasn’t saving a new generation of Wally’s Romano beans from the plants that finally podded out in last weekend’s sunshine. We sampled the first of the fresh green beans tonight. They’re pale green and flat, like little neckties, and they had a toothsome crunch with lovely sweetness. Just the sort of thing you’d want to pass on through generations. As we ate I remembered how Caroline once mentioned that Wally never married, never had kids. That he was the last in his line. Maybe it wasn’t such a stretch, then, that the beans were his hedge against the end of the world. My friend Caroline was finally planting her Romano beans, now that the soil was good and warm. She downplayed the event. “They’re like any Romano bean you can get from the seed catalogs,” she said. Except that Caroline’s seeds descended from ones her neighbor Wally gave her before he died a few years back, at age eighty-nine. He grew the beans for decades, having obtained his stock from childhood pals born and raised in Garlic Gulch, the old Italian settlement in the Rainier Valley, where immigrants once maintained small farmsteads. Caroline thinks the strain is hundreds of years old. She’s pretty sure they’ve always been grown organically. “Wally was kind of a health nut,” she said. He ate a cup of quinoa and a banana for breakfast. The beans he dried, stored in big pantry jars, and ate year round. He stood about 5 foot 2, Caroline said, and couldn’t have weighed more than 85 pounds. He never married, didn’t have children. Wally was systematic about his bean growing. He always sprouted the seeds on a damp paper towel and planted six around a 15-inch diameter circle. He trained the plants onto a central trellis constructed from a tall stake with scrap wood nailed on. Caroline told me the beans are real easy to grow and produce lots of nice pods. She grows them in waves, so there’s always a fresh supply; that’s how she prefers eating them. Later I searched a few online seed catalogs and discovered that some do indeed sell the Romano variety, also known as the borlotti, a flat green bean. 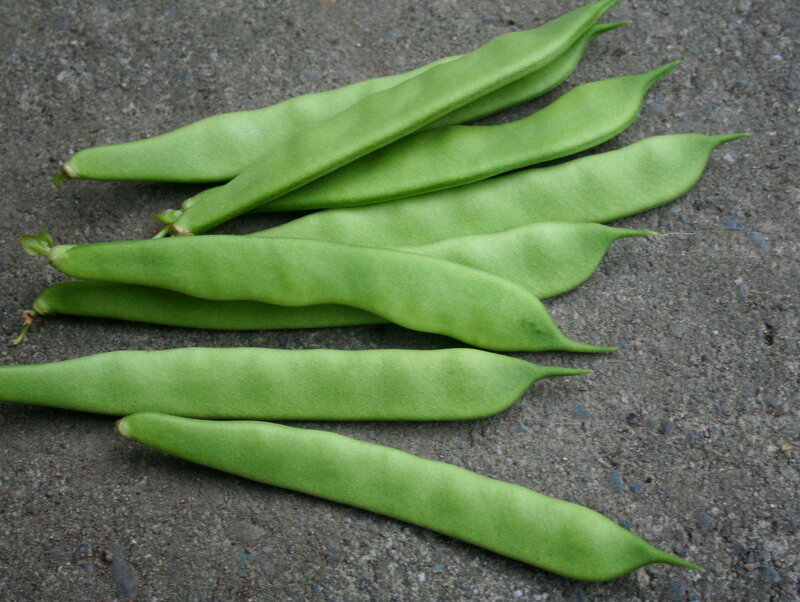 The Roma bean is a sibling; a more distant cousin may be the flat wax pole bean I grew last summer called Gold of Bacau. The seeds of Romanos are often white or black, but Caroline’s are tan, with brown speckles and fat racing stripes. Anyway, she sent me home with two of last summer’s pods. 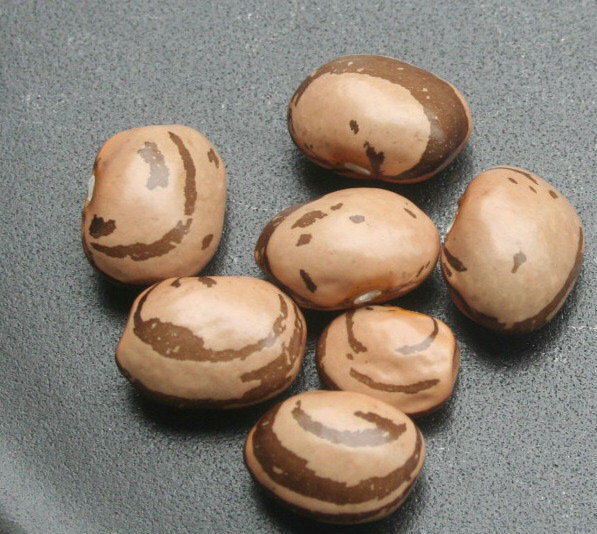 Back home, I put them in a damp towel to sprout, happy to do my part in propagating the bean and its history. Which reminds me that I need to read Claire Cummings’ book about genetically engineered seeds.